I’ve just bought an eBook or Lesson Plan, how do I download it? 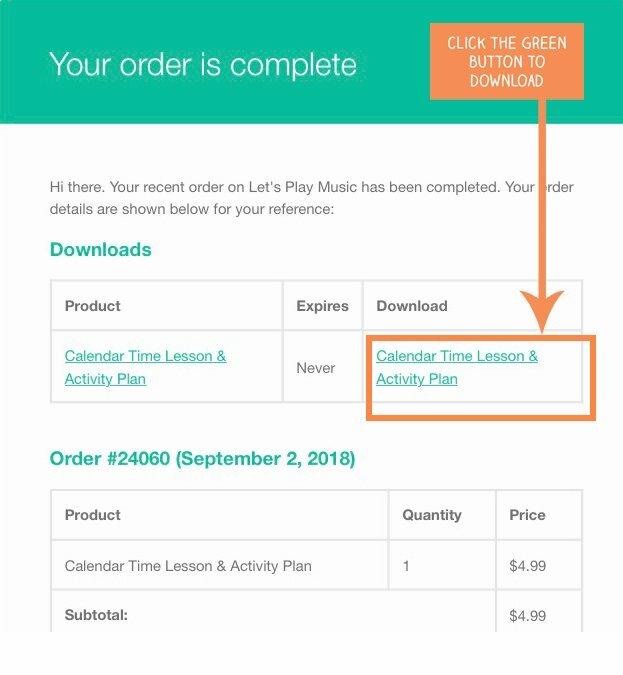 You can either download your eBook/Lesson Plan from the “Order Received” page after completing your purchase, or from your confirmation email. When you complete your purchase, you will go through to the “Order Received” page. This will look like the below. Click on the green box under “Download” to start the file download. Depending on what you’ve bought, the file sizes can be quite big, so it might take a while if you have a slower internet connection. Alternatively, you can easily click here to view the downloads available to you after you’ve purchased from the Let’s Play Kids Music store. 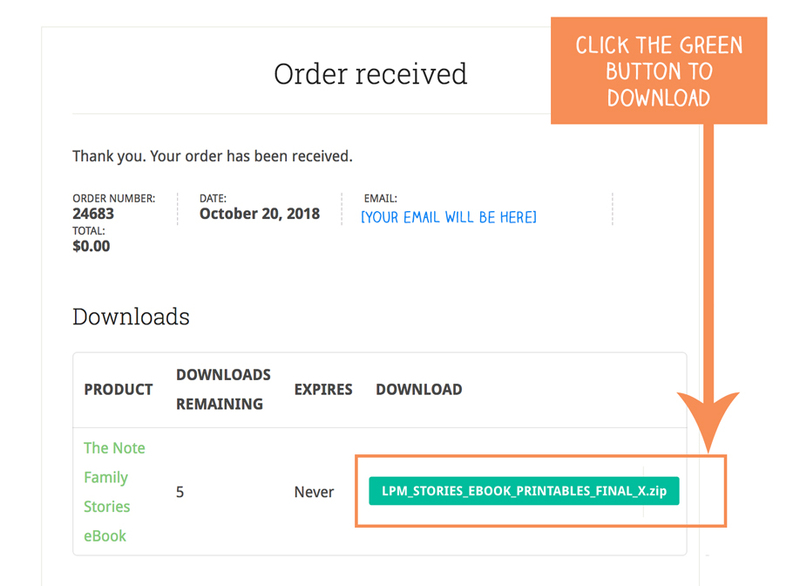 Simply click on the green download link next to the product you’ve purchased. An email confirming your purchase should arrive moments after you have bought your eBook. You’ll get one from Let’s Play Music as well as PayPal. If it hasn’t arrived in a couple of minutes, please check your spam folder. Click the green link underneath the download heading to download your file. What is a digital eBook? A digital eBook comes in the form of a PDF file and is sent by email. Once downloaded it is yours to view or print off yourself. What does the ebook or lesson plan download link look like? The digital PDF file download link will be sent in the form of a blue highlighted hyperlink, in the confirmation email under the word DOWNLOAD. I bought an eBook a while ago but didn’t download it straight away, and now the link is broken. Can you help? From time to time we update the files or our store plugin needs an update and this might break the link. Not to worry, drop us a line and we can send you the file direct via email. What is your refund or returns policy? Are the lesson plans suitable for multiple ages? I have always found that it is best to choose a single theme per week, and then adapt the activities for the different age groups. There are always some activities you can do with all classes. My lesson plans are suitable for toddlers through to 6 or 7 year olds and they can be easily adapted to suit the different age groups. The theme stays the same, but they have different activities in them that cater for slightly older or younger children. The Lesson Plans can be done in any order, depending on the seasons and age of the children that you’re teaching. This is because they all follow the same pattern of musical principles, so really the topic just helps to engage the children! But to help you get started, I’ve put them into an order for the Fall term (which you can find here) and i’ll be following the same format for the Winter, Spring and Summer terms too so watch this space! How do I download your Lesson Plans? Please refer to the same question for the eBooks above. Would it be ok to use one of your songs in our music group concert or nursery school play? Yes of course! We’d be delighted, but please could you also give Let’s Play Kids Music a credit in the programme or recommend the blog to a friend! For piano pupils, I’d recommend Teach Piano Today – they’ve got some really good piano books which will keep older kids engaged. Otherwise if you’re looking for more general musical activities, then YouTube is definitely the best. It’s a treasure trove of inspiration for group activities! I’m having trouble downloading some free printables from your website, can you help? If you click on the link and nothing shows on the screen, let me know via email because the link itself might have broken! If you can see the printable on your screen and it won’t print out, best thing to do is to try a different computer or printer.